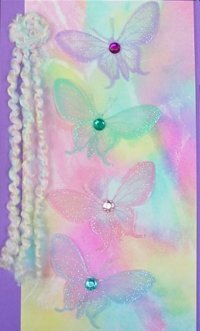 Stamp butterfly four times on vellum using colors from the Enchantment ink pad. Emboss with sparkle powder. Cut out and attach to background paper with double stick tape. Attach gems and yarn with glue. Layer to purple card stock. Note: You can make your own sparkle powder by adding ultra fine glitter to clear powder.